1 x juvenile rearing & 1 x quarantine for mange treatment and or injured adults. 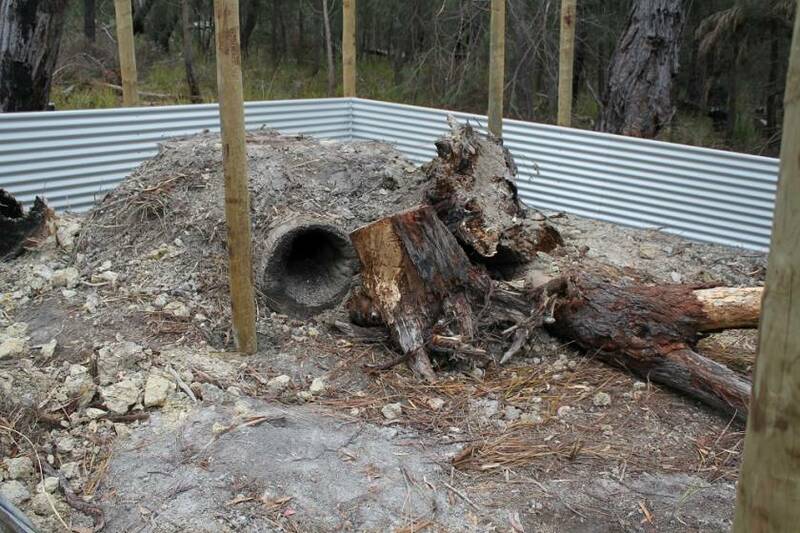 What a great start to our wombat enclosures funding, getting a grant from the WPSA, this will mean we are able to start the building of our new enclosure almost straight away. The grant arrived on 11/11/13, immediately we went back over our drawn plans to see if there were any last minute changes needed. We had been designing for months, choosing and discarding options for various reasons. There had been much googling of other people enclosures and we had taken what we thought were the best parts of each that we thought might work for us here in our Tasmanian weather and our heavy clay soil. 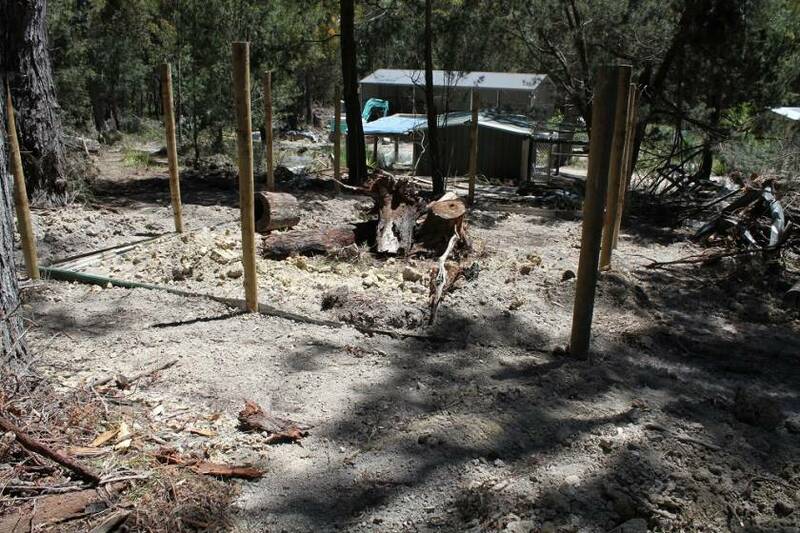 Do we have a gate or not seemed to be one of the main issues, it seems it provides a weak point in the enclosure for the very persistent wombat to work at, how big and where to site in regards to the house and driveway. After several more weeks of trying to think of everything and not make a mistake we came up with what we thought were the important functions for us, here. Shade ,shelter, quiet and secure, our plans were then, for a juvenile rearing enclosure closer to the house for a start and as soon as possible and a quarantine pen further away up in the bush where it would be very quiet . The nearer the house, rearing enclosure was needed asap as we have 2 dear wee wombats at present, Snappy; female and rearing to get out into a bigger pen and start digging and who is a holy terror on short legs, easily excitable and just loves to nip ankles and shoelaces. She adores her walks and loves to discover what's under that log or in that patch of long grass and also the mad half hour run , what speeds a short chubby girl can reach. Two mornings ago we went out into the nursery where Snappy still spent her nights ( safe from Quolls) and she had demolished her playpen and was tearing around chasing the Bennetts wallaby joeys and chewing furniture and just generally creating havoc. She had the gleam of excitement in her eyes and was making little sounds of pure delight at the chaos that was ensuing. Once put out into her daytime area, peace returned to the nursery and all the joeys settled into their bottles with no ill effects. And Douggie, a smaller male who is just content at present to drink his bottle and sigh & snuggle but we all know how quickly that can change,( he was brave enough to take his first walk today )he still doesn't like a big space, its enough to make a chap run back to his pouch and shut his eyes and keep the world out, drift off into the safety of sleep and dream wombat type dreams. our heavy clay was going to be a bigger issue than first thought , we had already decided that because of the clay, the tree stumps and den and burrow area should be above ground but appearing to be built into the side of a small hill so that flooding in our wet Tasmanian winter would not be an issue. The 2nd enclosure which was further away and on higher ground was then looked at and the water level here was much lower so it was decided to start with this one first as we could put the two littlies in it as a stopgap measure until both where built. The chosen area was on the higher side of the refuge driveway and quite a way back where traffic would not be an issue but able to be driven up to as its a little hard carry a sick heavy , fully grown adult through the bush. This would be where we would treat any incoming wombats with treatable mange. What a horrible parasite and such a cruel way to slowly and painfully die for the poor animals when they reach stage 3 and its just too late for help then , better a quick painless end. Luck was in and up here was much drier and even less heavy with clay, on a slope, the ditch was dug and the poles concreted in , the 2nd hand tin sheets were put in and attached to the poles then the ditch was backfilled both sides and tamped down firmly to keep everything secure, hopefully there would not be a successful escape via tunnel method. Then the framework was added as we are going to be covering the whole structure with chicken wire. On the high side of the run we have decided to have some tin roofing which would be an all weather shelter and which will actually cover the burrow/ den and the digging/ stumps area will be directly below this. So extra poles were then concreted in and framed up. Geoff had used the digger to drop three huge iron bark stumps into place arranging so as to leave little nooks and crannies that could be explored or dug under .A den was constructed on the ground surface using more thinner tree trunks in a log cabin type arrangement with the entrance a large hollow log inserted into one corner of the den. This would provide a cool , dark sleeping area and on the roof of the den an inspection hatch was made of thick ply, insulation and another sheet of ply, this allowed us access to the den area in an emergency and for parasite eradication between residents. Then the whole lot was covered with a layer of soil, giving especially to the wombats the impression that it was all underground or at least built into the side of a hill, but up and out of the way of any flooding. What a bonus the ground is actually quite sloping here. We are at this point right now; watch this space for the continuing story!!! Our grateful thanks to those that recommended us for the grant and to the Wombat Protection Society of Australia for helping with the funding for these sorely needed wombat runs here on the east coast of Tasmania.